We've compiled some important statistics and stories about homelessness. It's hard to get reliable numbers, but it's important to try, because homelessness is so much more common than people realize. There is a stereotype of homeless people as drug addicts and criminals, and that stereotype keeps people from asking for help when they need it. Homelessness has many faces in America, and it's time to get educated and understand that A) you're not a failure just because you lost your home and B) your community will welcome you and stand by you in your time of need. If you need help, find out more about what Family Promise can do for you! 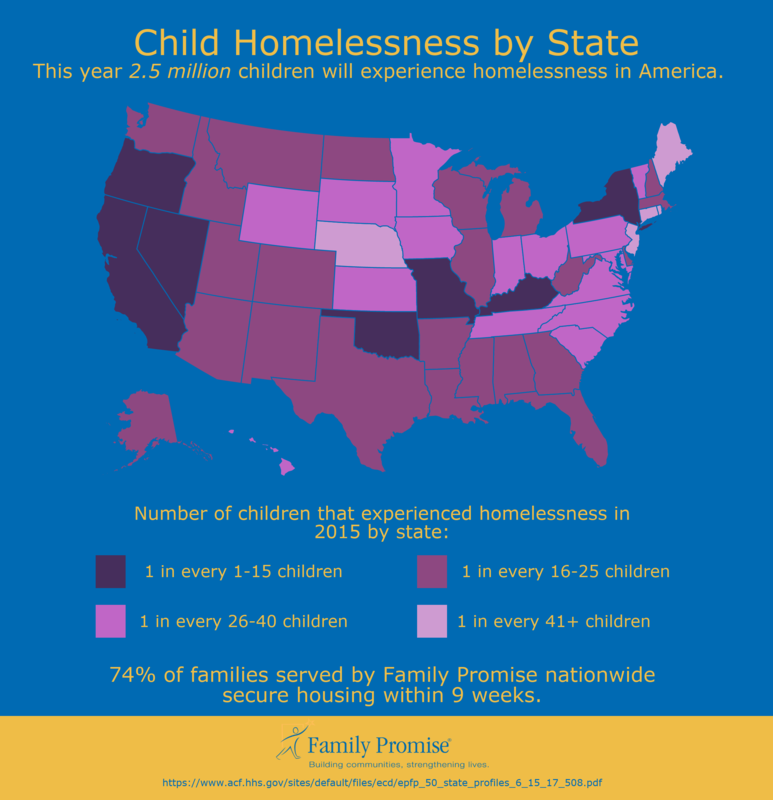 Our national headquarters put together a nifty infographic breaking down the U.S. Health Human Services Department's findings and projections on childhood homelessness, state by state. If you notice, Montana is projected to have 1 homeless child out of every 16-25 children. And those numbers are based on the number of homeless children under the age of 6 reported by the U.S. Census and other sources. The odds are good that there are more who go unreported. Here's some of the numbers that the U.S. Department of Housing and Urban Development (HUD) released in January 2018, concerning Montana homelessness in 2017. There's two things you should know about those numbers-- A) They're based on the HUD's definitions of homelessness and B) They're based on the homelessness we know about. Out of the 22 families who entered our program in 2017, 10 were previously living with friends/family, a common resort for families who struggle with layoffs, evictions, etc. It's not always easy to share this information with others. The actual number of homeless people and homeless families in Montana may be much higher. We pulled this chart from our 2017 annual report. In one year alone, out of 22 homeless families who entered our program, 63% of them came to us because the price of available housing was simply too expensive. Because of the social stigma attached to homelessness, it's difficult to get an accurate number of how many families total in Great Falls and America A) have lost their homes, B) are about to lose them, C) are just one catastrophe or missing paycheck away from being in danger of losing their homes. Would you tell a stranger with a clipboard that you can't afford to keep a roof over your family's head? What we do know is that, according to the NLIHC, the state of Montana had an average of 44 affordable homes available for every 100 households with A) an income at/below the Poverty Guideline or B) an income 30% or less of the average annual income. "A worker needs to earn $12/hour to reach the poverty level for a family of four." "A renter needs to earn $21.21/hour to afford a two-bedroom rental in the U.S."
"In only 12 counties in the country can a worker making the federal minimum wage afford a Fair Market Rent one-bedroom apartment." "11 million households now pay more than 50% of their income for housing–an increase of 20% since 2007." "Only 25% of those eligible for federal housing assistance receive help, due to lack of funding." "For every ten extremely low income households, there are only three affordable rentals available on the market." "To meet the needs of low-income families, we need 4.5 million affordable housing units added to the current supply." Homelessness isn't just a result of poverty; it's an integral symptom. In Great Falls, according to the U.S. Census, the poverty rate was 16.1%, the average monthly rent was $642, and the average annual household income was $43,497 in 2016. "Nearly 40 million people (1 in 8) in the U.S. live below the poverty line." "1 in 6 U.S. children under age 18, or 13 million, live in poverty." "In 2000, 12 million U.S. children (17%) lived in poverty. By 2017, that number had grown to nearly thirteen million children (17.5%)." "In 2018, the poverty line for a family of four is $25,100." "In America, just over 16 million children live in households where they have to skip meals or eat less to make ends meet." "Two-thirds of poor children live in families in which at least one family member works." "There are about 165 homeless students currently in the Great Falls Public Schools district, according to Lee Houle, who hears their stories every day. Succeeding in school is no small feat. It's harder when you're homeless. Oftentimes, that also means you're hungry. The American Federation of Teachers reported in 2018 that, "According to the National Center for Children in Poverty, [...] By the time children living in poverty are four years old, they lag 18 months behind what is “normal” cognitive development for their age group. By third grade, their vocabulary is one-third that of their middle-income peers: about 4,000 words to their peers’ 12,000." 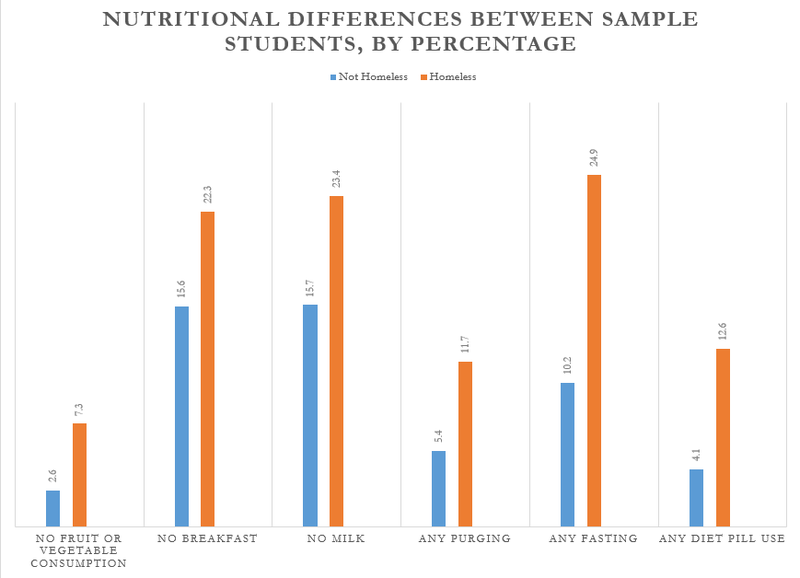 The Journal of School Health published a study in 2009 that tried to get some solid data on the relationship between homeless students, and school hunger, based on a sample taken from the 2005 Massachusetts Youth Risk Behavior study. You can see the difference between responses in that survery between homeless and non-homeless students. That may be based on data from the East Coast over a decade ago, but it reinforces that access to food is difficult when you're struggling to find a permanent place to live in the first place.